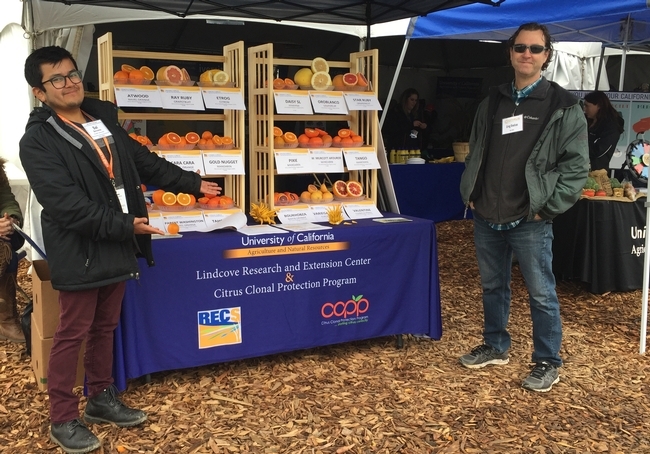 Ashraf El-Kereamy was appointed UC Cooperative Extension citrus horticultural specialist in the Department of Botany and Plant Sciences at UC Riverside on Feb. 1, 2019. He had been working as a UCCE area viticulture advisor serving Kern, Tulare and Kings counties since 2014. Prior to joining UCCE, El-Kereamy worked as a post-doc research associate at University of Guelph, studying plant drought and heat stress tolerance in plants from 2013 to 2014, and studying the genotypes variation in nitrogen use efficiency and plant heat stress tolerance from 2008 to 2012. From 2012 to 2013, he was assistant/associate professor in the Department of Horticulture, Ain Shams University, Egypt, where he taught undergraduate and postgraduate courses for horticultural science and served as the principal investigator for a U.S.-Egypt joint collaborative research project between University of Wyoming and Ain Shams University on improving grapevine tolerance to drought and heat stress. As a post-doctoral scientist at the University of Guelph, Vineland, El-Kereamy studied the pathogenesis-related proteins during plum fruit ripening. As a University of Manitoba post-doc, he studied the physiological role of abscisic acid in plants. He earned his Ph.D. in agriculture with an emphasis in grape physiology and molecular biology from INP-ENSAT, Toulouse University, Toulouse, France, and a M.Sc. in pomology and B.Sc. in horticulture, both from Ain Shams University, Cairo, Egypt. El-Kereamy is based at Lindcove Research and Extension Center in Exeter, and can be reached at (559) 592-2408, Cell: (661) 703-4678 and aelkereamy@ucanr.edu. Follow him on Twitter at @ashrafelkereamy. Prior to joining UCCE, Galdi was a junior specialist at UC Davis (May 2017 – December 2018), where he worked on a variety of field trials, mainly alfalfa and forage crops, with the objective to improve sustainability of water use and hay quality. Tasks included irrigation scheduling, planting/harvesting trials, and data handling and analysis. As a master's student and student research assistant at Fresno State (2014-2017), Galdi evaluated salinity tolerance in different alfalfa varieties, attended conferences, and presented research in the form of posters and talks. He speaks Portuguese fluently. Galdi completed a M.S. in plant sciences from Fresno State and a B.S. in agronomy engineering from University of Sao Paulo, Brazil. Grettenberger earned a Ph.D. in entomology from Penn State University and a BS in biology from Western Washington University. 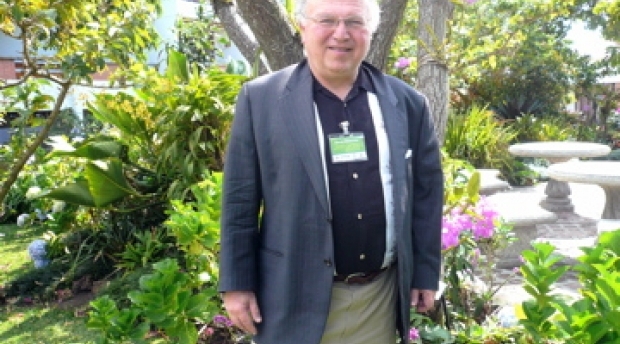 Prior to joining UCCE, Grettenberger was a postdoctoral research scholar at UC Davis, working first with Larry Godfrey and then with Frank Zalom. Yu Meng joined UCCE on Jan. 2, 2019, as the youth, families and communities advisor serving Imperial County, UC Desert Research and Extension Center and communities near the U.S.-Mexico border. Her responsibilities will focus on providing community development programs in the area of youth, families, and communities, with major outreach to the Latino youth and families. Prior to joining UCCE, Meng worked for a USDA-funded project known as "the WAVE~Ripples for change" in collaboration with Oregon State University professionals, extension, community partners, high school soccer coaches, and school districts, and other dedicated volunteers. The program was designed to prevent unhealthy weight gain among 15- to 19-year-old soccer players. Most of the youth she worked with were Latinos and from low-income families. During this time, Meng helped develop and test the first sports nutrition, physical activity, family and consumer sciences curriculum for active youth. Her work resulted in positive developments in youth, reducing added sugar intake, maintaining fruit and vegetable intake over time, and improving the awareness of sports nutrition. Participating youth also applied additional skills they learned from gardening and cooking workshops at their homes and shared the lessons and practical applications with their respective families. Meng is fluent in Chinese and originally from China, where she worked for food industries and started to notice the nutrition issues with processed foods and their effects on children's health. With that in mind, she came to the U.S. and earned a master's degree and Ph.D.
She completed a Ph.D. in nutrition science from Oregon State University, a M.S. in food science and nutrition from Utah State University, and a B.S. in Food Science and Engineering from Southern China University of Technology, China. 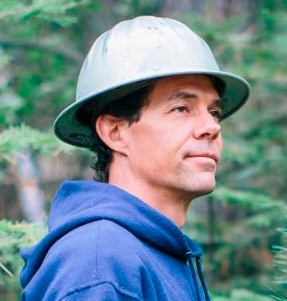 York is a Registered Professional Forester in California. He earned a Ph.D. in forest ecology and silviculture, a M.S. in forest community ecology and a B.S. in forest management, all from UC Berkeley. Linda Forbes joined UC ANR as Strategic Communications director on Feb. 19. Forbes brings over 15 years of communications experience as a marketing and branding leader in the private sector and most recently at UC Davis. Since 2012, she served as associate director of marketing at UC Davis, leading initiatives such as the award-winning monthly Aggie Tip Sheet and major advertising campaigns, as well as collaborating with campus colleagues to promote the impact and value of UC Davis on a variety of digital platforms. Travelers who fly out of the Sacramento airport may have seen ads from the last campaign she led, which included the “You sip, we solve” ad showcasing UC Davis advances in protecting the water supply. Before coming to UC, Forbes led marketing for a statewide accounting firm and managed an automotive aftermarket brand. But Forbes, whose father was a USDA veterinarian, had a desire to contribute her skills to an organization that solves agricultural and environmental issues. Forbes is located in room 175 in the ANR building in Davis. She can be reached at (530) 750-1204 and lforbes@ucanr.edu. 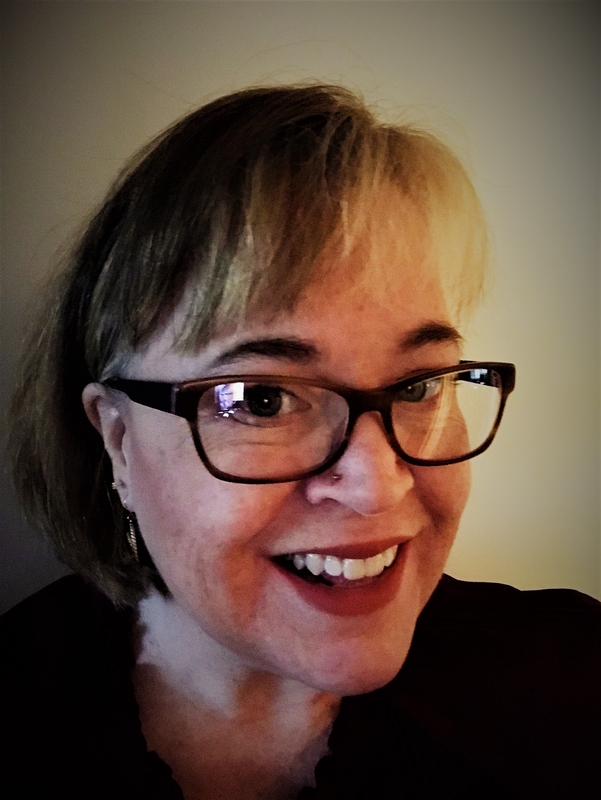 Anne Marie Scott joined ANR's Business Operations Center as ANR payroll manager on Feb. 7, 2019. Scott brings strong payroll management and UCPath expertise with 19 years of UC experience in payroll, employment tax and accounts payable management. Most recently, she served as the payroll manager for the UC Office of the President working in the new UCPath system for the past year and a half. Prior to UCOP, she worked for UC Davis for 17 years as a payroll accountant, accounts payable division manager and also as the payroll manager for one of UCD's new shared service centers. She is also a Certified Payroll Professional. Her experience working in the UCPath system at UCOP will uniquely enhance ANR's transition of payroll services to the new UCPath system. Scott will lead the ANR BOC payroll team providing time reporting and payroll services to all ANR units statewide. She will also work closely with the ANR Human Resources team to ensure efficient coordination between HR actions and payroll services. 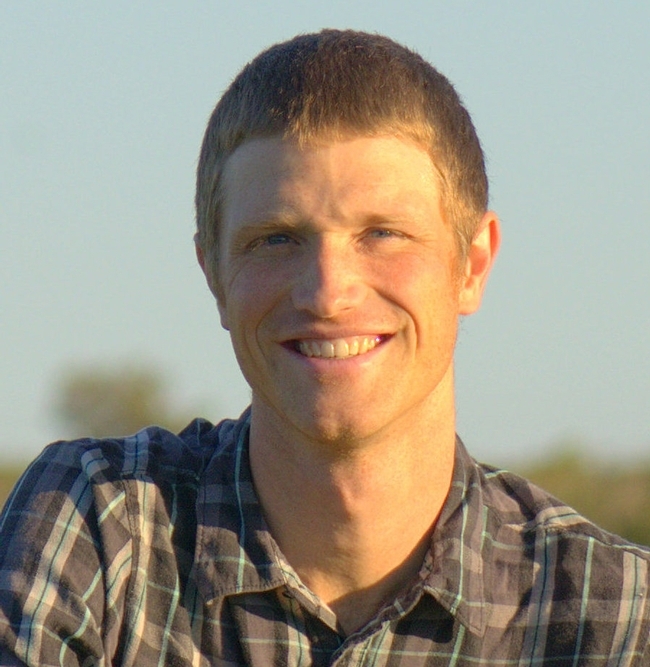 Scott is based at the ANR Building in Davis and can be contacted at ascott@ucanr.edu and (530) 750-1273. David Zilberman, a UC Cooperative Extension specialist and professor of agricultural and resources economics at UC Berkeley, has been awarded the 2019 Wolf Prize in Agriculture in recognition of his work developing economic models for fundamental problems in agriculture, economics and policy. The Wolf Prize is an international award granted by the Wolf Foundation in six categories: agriculture, chemistry, mathematics, medicine, physics and the arts. The prize in the agriculture category is often referred to as the equivalent of a Nobel Prize in agriculture. "I am deeply honored to have been selected,” said Zilberman, who holds the Robinson Chair in the Department of Agricultural and Resource Economics. “This prize is a recognition of my entire community: my family, my collaborators, my teachers in Israel and Berkeley, the College of Natural Resources, and the uniquely supportive and inspiring Berkeley campus." 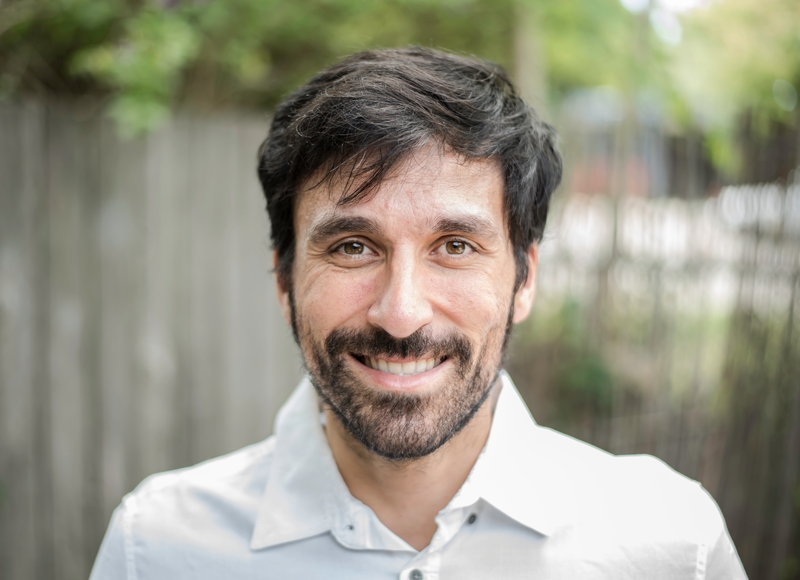 Read more about Zilberman's career achievements at https://nature.berkeley.edu/news/2019/01/david-zilberman-awarded-wolf-prize-agriculture. From left, Josh Davy, Fadzayi Mashiri,Guy Kyser and Jeremy James. The Weed Science Society of America honored four ANR members with its Outstanding Paper Award, Invasive Plant Science and Management. Medusahead grass at Sierra Foothill Research and Extension Center. Their co-authors were Matthew J. Rinella, U.S. Department of Agriculture-Agricultural Research Service; Susan E. Bellows, U.S. Department of Agriculture-Agricultural Research Service, and Vanelle F. Peterson, Dow AgroSciences. The award was presented Feb. 11 during the organization's annual meeting in New Orleans. From left, Assemblymember Jose Medina, Paul Granillo and Glenda Humiston. 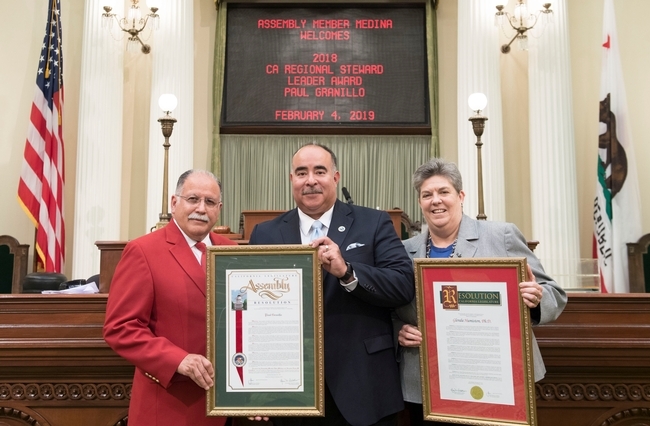 The California Legislature recognized Vice President Glenda Humiston and Paul Granillo, president of the Inland Empire Economic Partnership, as recipients of the California Economic Summit's 2018 Steward Leader Awards on Feb. 4. Humiston received the California Steward Leader Award, which recognizes statewide contributions, and Granillo received the Regional Steward Leader Award, which recognizes regional contributions. The awards were presented at last year's California Economic Summit. Senator Anna Caballero and Assemblymember Jose Medina issued joint resolutions to Humiston and Granillo commending their exemplary records of civic leadership, both have served on the California Economic Summit Steering Committee since its inception in 2011. Caballero read a resolution recognizing VP Glenda Humiston as recipient of the 2018 California Steward Leader Award. Read more about Humiston's award at https://ucanr.edu/blogs/blogcore/postdetail.cfm?postnum=28665. Surendra Dara explains how fungi kill insects. People from across California and around the world got to taste new crops, see research demonstrations and learn about several UC ANR activities at the World Ag Expo Feb. 12-14. Despite the cold rainy weather, the world's largest agricultural exposition attracted 102,878 people representing 48 states, the District of Columbia and 65 countries to Tulare. At an outdoor tent, Beth Grafton-Cardwell, UC Cooperative Extension specialist, Greg Douhan, UCCE citrus advisor, and other researchers, handed visitors fresh Tango citrus grown at the Lindcove Research and Extension Center and told them about their citrus variety research. Sal Barcenes, Lindcove staff research assistant, and Greg Douhan show citrus varieties. 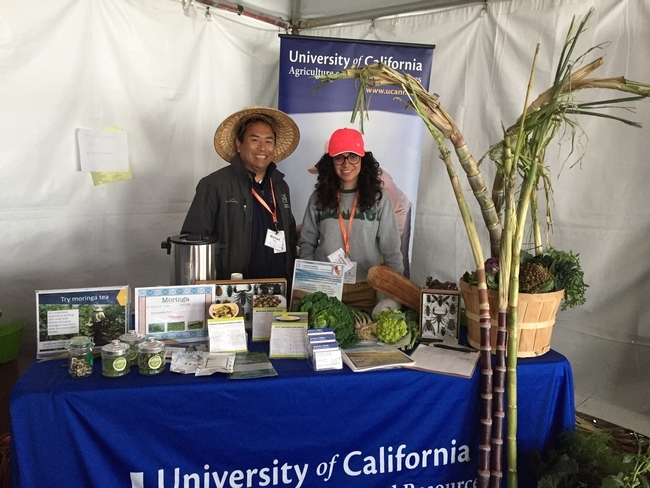 Ruth Dahlquist-Willard, UCCE small farms advisor, and Michael Yang, small farms and specialty crops agricultural assistant, encouraged visitors to taste moringa tea. 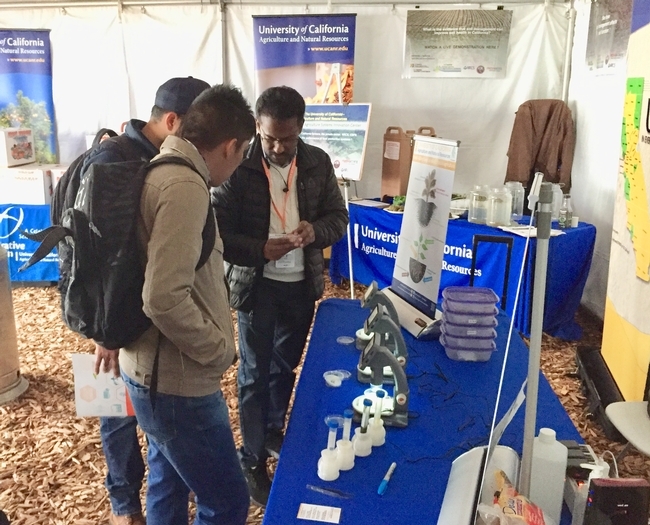 Surendra Dara, UCCE entomology and biologicals advisor, described how Bagrada bugs and other pests under the microscopes can be controlled by microbes. 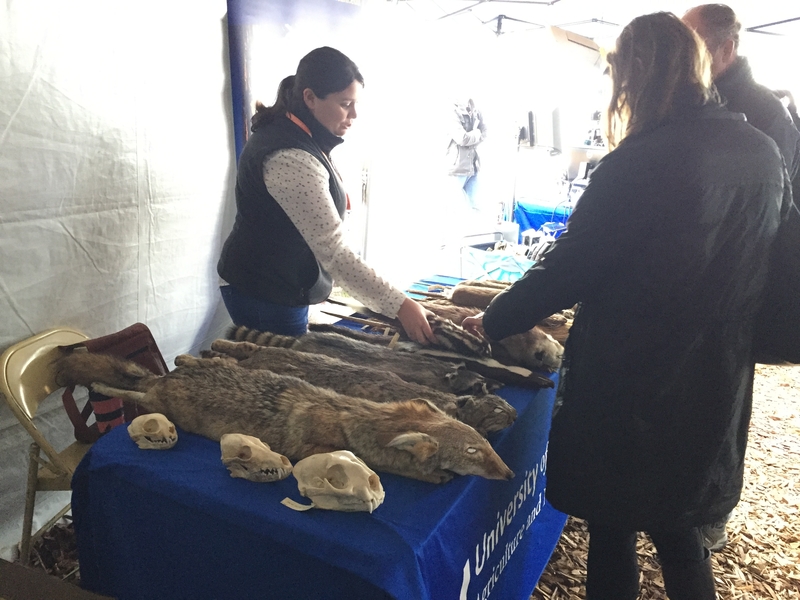 Roger Baldwin, UCCE wildlife specialist, and Niamh Quinn, UCCE urban wildlife conflict advisor, took turns showing taxidermy vertebrate pests and describing their management research. Michael Yang and Lorena Ramos, staff research and marketing associate for the UCCE small farms and specialty crops program in Fresno and Tulare counties, offered visitors hot moringa tea. Jeff Mitchell, UCCE specialist, and Jeff Dahlberg, Kearney Agricultural Research and Extension Center director, gave demonstrations to show the superior health of soils managed with conservation techniques. 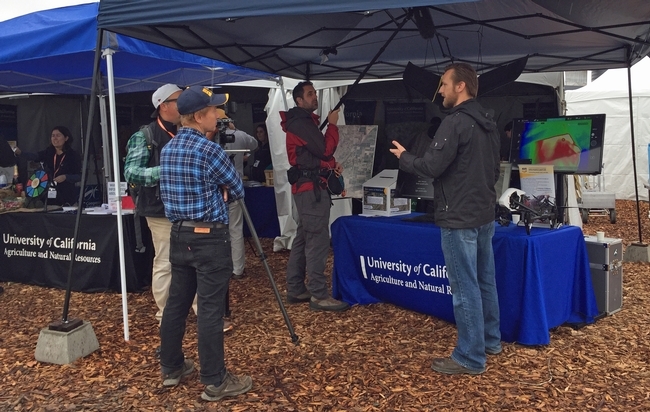 Demonstrating the use of high-tech in agriculture, Sean Hogan, Informatics and Geographic Information System academic coordinator, Andy Lyons, IGIS program coordinator, and Jacob Flanagan, IGIS programmer, showed how they use drones and cameras in agricultural research. A PBS news crew interviews Andy Lyons and Jacob Flanagan. 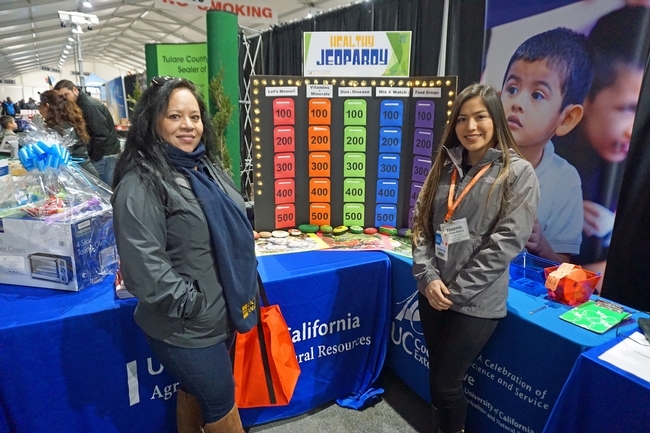 Inside Pavilion A, Teresa Rios-Spicer, UCCE nutrition program manager, andYeseniaMedrano, UCCE community education specialist, both from Tulare County, challenged visitors to test their nutrition knowledge by playing Jeopardy! 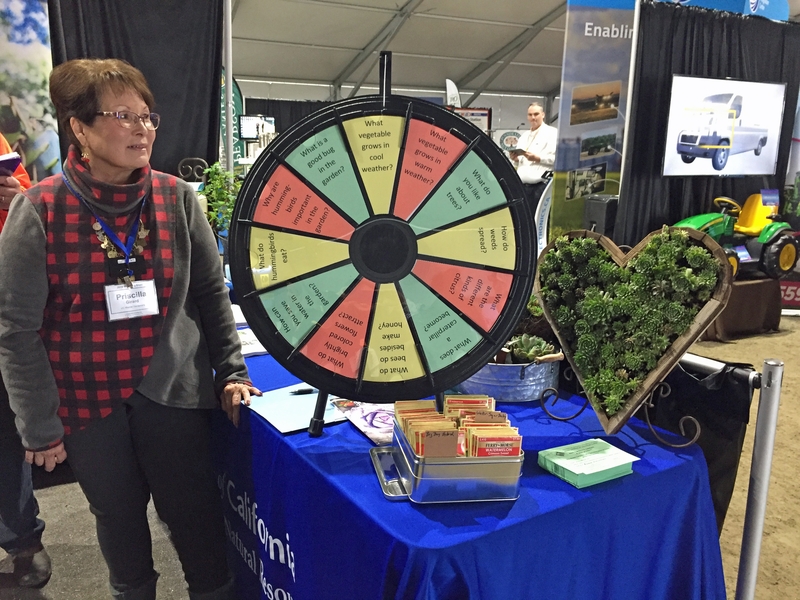 Visitors could spin the UC Master Gardeners prize wheel to answer gardening questions and win seeds. 4-H members invited youth to peer into virtual reality goggles to give them an idea about the fun activities that can be part of joining 4-H.
Teresa Rios-Spicer, left, and Yesenia Medrano challenged visitors to test their nutrition knowledge at Healthy Jeopardy! Frank Mitloehner, UC Cooperative Extension specialist, gave a seminar explaining confusion in the media about the amount of greenhouse gas livestock emit in California and globally. 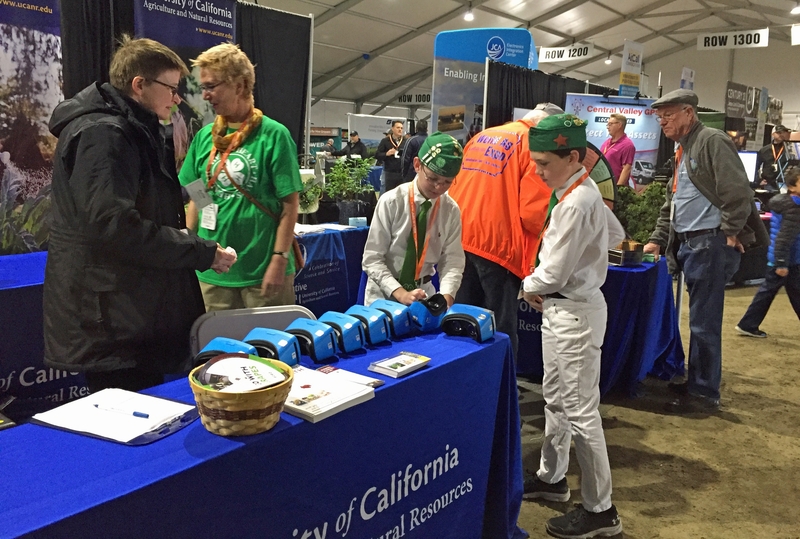 He reviewed the innovations in livestock production that are leading the way to a "greener future" for California and U.S. agriculture. Niamh Quinn describes how the spotted skunk stands on its hands and shakes its tail. Beth Grafton-Cardwell, UC Cooperative Extension citrus entomology specialist, and Victoria Hornbaker of the California Department of Food and Agriculture, gave an update on regulatory protocols relating to Asian citrus psyllid and HLB quarantines and the proper transportation of bulk citrus to prevent the spread of the pest and disease. The California and Dutch AgFoodTech innovation partners reunited in Tulare for a networking luncheon to share their action plan with invited guests and scope the projects. 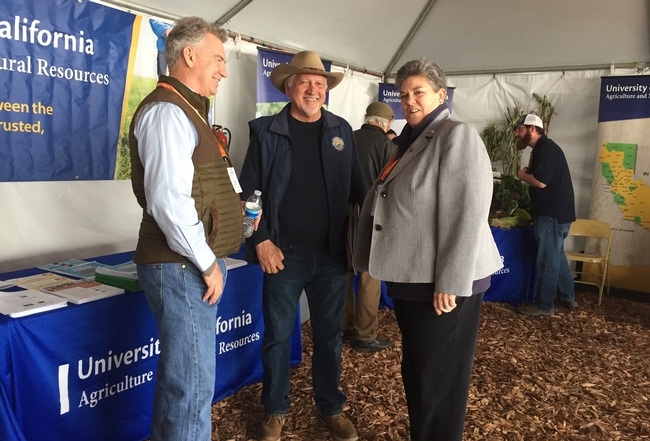 UCCE advisor Dan Munk, left, greets West Side farmer Joe Del Bosque and VP Glenda Humiston. 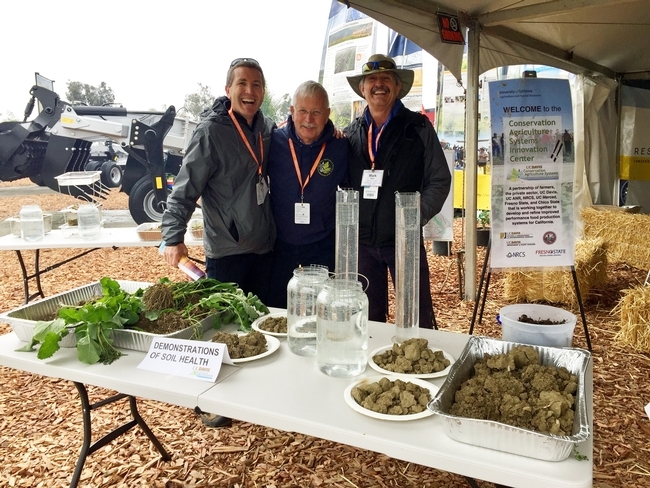 Jeff Mitchell, center, talks about soil health with Scott Brayton of Development Services, left, and Mark Bell, vice provost of of strategic initiatives and statewide programs. 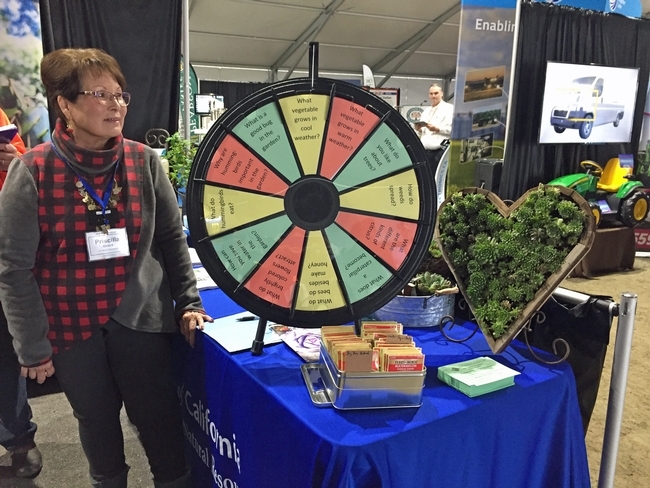 UC Master Gardener volunteer Priscilla Girard answered questions about gardening. From left, Liz Sizensky of UC Nutrition Policy Institute, and Julie Sievert, assistant KARE program and facility coordinator, assist 4-H members with virtual reality goggles. President Janet Napolitano thanked Don Bransford and everyone who provided information to the UC ANR Advisory Committee. She announced she would be moving forward on the committee's recommendations. The UC ANR Advisory Committee, appointed by President Janet Napolitano to consider options for UC ANR's structure, governance and funding, submitted its recommendations to her, Don Bransford told the UC President's Advisory Commission on Agriculture and Natural Resources (PAC), which met Dec. 18 at the DoubleTree by Hilton in Berkeley. PAC Chair Bransford, who also served on the UC ANR Advisory Committee, said the committee saw opportunities to strengthen governance, increase budgetary transparency, provide more stable and predictable funding models and enhance collaborations between UC ANR and UC's broader academic and research enterprise. The committee, which included deans Kathryn Uhrich of the UCR College of Natural and Agricultural Sciences and Michael Lairmore of the School of Veterinary Medicine at UC Davis, consulted internal and external stakeholders, then conducted its own analyses in consultation with UC ANR leaders. Maintain UC ANR's status as a systemwide program within UCOP, reporting to the president. Create a UC ANR governing council for oversight and to promote greater understanding of UC ANR across the university. Create a funding model using a combination of the “set-aside” and “corridor” models. Retain campus oversight of and reporting responsibility for state Agricultural Experiment Station funds. Napolitano told the PAC she would be moving forward on the recommendations because she thinks they will ensure ANR greater budget stability, a broader understanding of ANR across the UC system and create more opportunities for collaboration between ANR and campus academics. She issued a statement Dec. 19 on her decisions for UC ANR. Uhrich said she sees the governing council as an “opportunity to educate, integrate and be inclusive” to have people from across the UC system and outside of UC participating. In other discussions, Napolitano commended ANR employees for their responses to the Camp Fire and Woolsey Fire, noting that employees and volunteers lost homes in the devastating wildfires. 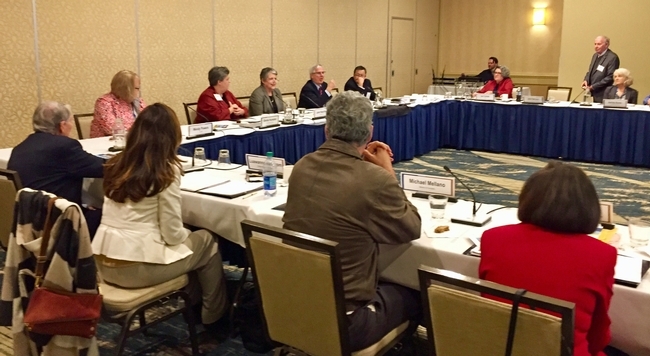 At a recent meeting with some legislators to discuss automation and the future of work, wildfire, health issues and homelessness, Napolitano said the policymakers told her they want to hear more from UC experts to help them think through policy challenges. During her budget presentation, Humiston said ANR must slow its use of reserve funds and develop new funding sources. Humiston and Tu Tran, associate vice president for business operations, briefed the PAC on ANR's budget. Administrative costs are up this fiscal year to invest $4 million to join UCPath, the new systemwide payroll and personnel system. UC ANR has begun the transition and will go live in March-April. “Ultimately UCPath will save us money, but it's costing us now,” Humiston said. Due to budget constraints, Humiston explained that UC ANR isn't offering competitive grants nor announcing UCCE positions to be filled in 2018-19. Recruitment for previously approved positions is ongoing and new hiring will begin as resources become available to make the long-term commitment to support positions. In her budget PowerPoint presentation for the PAC, Humiston listed actions ANR has taken in the past to compensate for budget cuts and steps that will be taken in FY 2018-19. UC Merced's librarian HaiPeng Li, project archivist Lisa Valens and project director Emily Lin gave a presentation on the California Agricultural Resources Archive or CARA. The UC Cooperative Extension archive project, which was launched after UC Cooperative Extension's centennial in 2014, started with UCCE in Merced, Humboldt and Ventura counties. The team has been digitizing annual reports and historical photos to make them accessible to the public and researchers. Mining the data, advanced analysis and linking to other information might open new avenues of research, she said. UC ANR is seeking partners and trying to raise funds for the archive project. Jim Downing, publications director, will assume leadership of the project to succeed Jan Corlett, chief of staff to the vice president, who plans to retire in July. 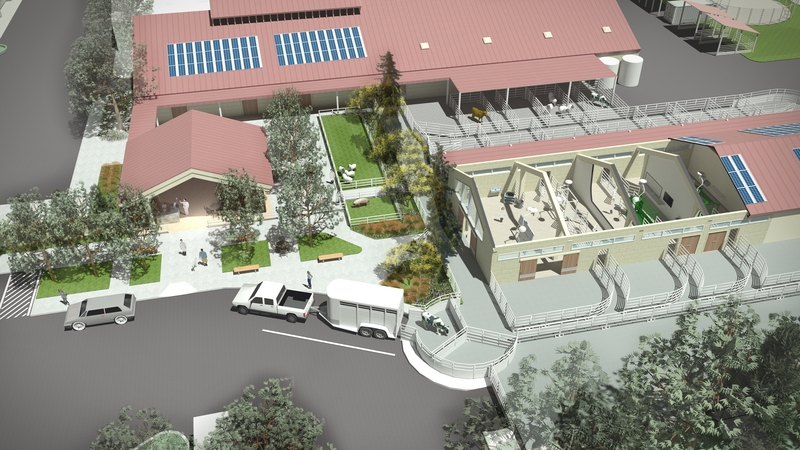 The School of Veterinary Medicine is planning to build a Livestock & Field Services Center. To help students with career planning, Helene Dillard, dean of the UC Davis College of Agricultural and Environmental Sciences, said she seeks UCCE advisors to show students the research and outreach being done in the counties and planning a course on Cooperative Extension to introduce students to career options. She is in talks to partner with UC Davis medical center on health research such as the connection between diet and disease. David Ackerly, dean of the UC Berkeley College of Natural Resources, announced the recent hiring of new Cooperative Extension specialists Ellen Bruno for policy analysis and Rob York for fire and policy, and that he is striving to create new faculty positions that will not depend on state money. 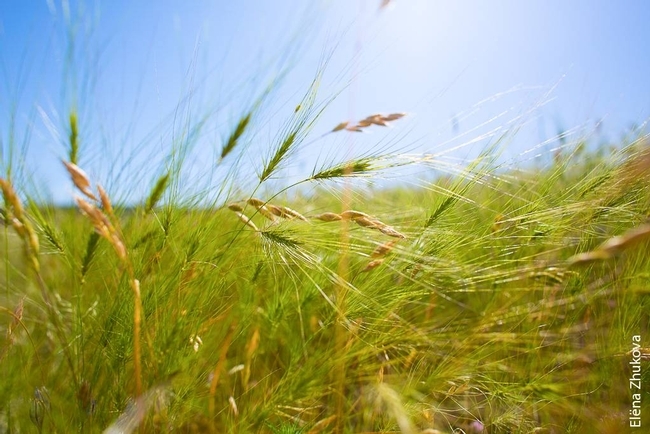 He also announced that UC Cooperative Extension specialist Adina Merenlender received a $5 million gift to train California climate stewards through a program similar to California Naturalist. Ackerly also noted that Giannini Hall is closing temporarily for seismic upgrades so faculty and staff are packing to move out during construction. Katherine Uhrich, dean of the UC Riverside College of Natural and Agricultural Sciences, announced CNAS has hired 24 faculty this year including two Nobel laureates – Richard Shrock and Barry Barish. She also announced that Givaudan, a Swiss company that creates fragrances and flavors, is donating funds to cover UCR's citrus variety collection, to protect the trees from pests and diseases. Michael Lairmore, dean of the School of Veterinary Medicine at UC Davis, announced that his veterinary team worked tirelessly treating animals injured during the Camp Fire, taking in 70 animals, most of which have returned to their families. About $2 million has been donated to offset the costs of treating the animals. Veterinarian Jamie Peyton covered burns on cats and dogs with tilapia skin to help with healing and has a provisional patent for the fish skin treatment. Lairmore also announced the school is planning to build a Livestock and Field Service Center. “We are in need of donations and there are naming opportunities for interested individuals or companies,” Lairmore told PAC members. He also announced the hiring of Emmanuel Okello, the new UCCE specialist in antimicrobial stewardship. The PAC, which meets twice a year, will meet next in the spring. Annemiek Schilder joined ANR on Aug. 1, 2018, as director of UCCE Ventura County and Hansen Agricultural Research and Extension Center. She hails from the Netherlands, where she grew up in an extended family of dairy and field crop farmers. Her grandfather, who farmed well into his 90s, inspired her to follow a career in agriculture. Schilder studies small fruit pathology, mycology, applied virology, plant disease diagnostics, integrated pest management and organic and sustainable disease management. 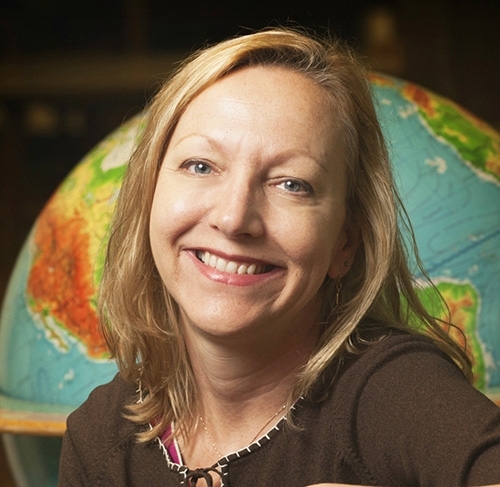 She joins UC ANR from Michigan State University, where she was associate professor from 2006 to 2018 and an assistant professor from 1998 to 2005 in the Department of Plant Pathology and Department of Plant, Soil and Microbial Sciences. At MSU, Schilder was responsible for research, extension and teaching of sustainable disease management in small fruit crops, such as grapes, blueberries, strawberries, raspberries and cranberries. She studied the diagnosis, epidemiology and integrated control methods for major fungal and viral diseases of these crops, and worked closely with entomologists, horticulturists, plant breeders, agricultural economists, extension educators, and growers to develop a holistic approach to plant health. Schilder also holds an adjunct faculty appointment in the Department of Plant, Food and Environmental Sciences at Dalhousie University in Nova Scotia, Canada. From 1994 to 1997, Schilder was a postdoctoral fellow at the International Institute of Tropical Agriculture in Ibadan, Nigeria, researching legume and cassava diseases, seed health, and plant quarantine issues, and gaining an appreciation for the challenges faced by African farmers. Schilder earned a Ph.D. and M.S. in plant pathology (cereal diseases) from Cornell University and a B.S. in agronomy from the University of Louisiana at Lafayette. She also studied plant sciences for a year at Wageningen Agricultural University in The Netherlands. Schilder is based in Ventura and can be reached at (805) 662-6943 and amschilder@ucanr.edu. 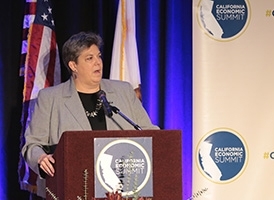 Vice President Glenda Humiston received the 2018 California Steward Leader Award at the California Economic Summit Nov. 16. She currently serves on the 2018 Economic Summit Steering Committee, and is the Action Team co-lead for Working Landscapes and co-chair of the Elevate Rural California initiative. “I was really involved in the 1990s in trying to figure out how agriculture and environmental interests find common ground, as well as building bridges between rural and urban sectors," Humiston said. "In the 2000s, I started focusing on economic development and sustainability. In my current job, I'm bringing all of those together around the reality that sustainability truly has to be a triple bottom line. We've got to develop ways for people, the planet and prosperity to all thrive and enhance the synergies between them." 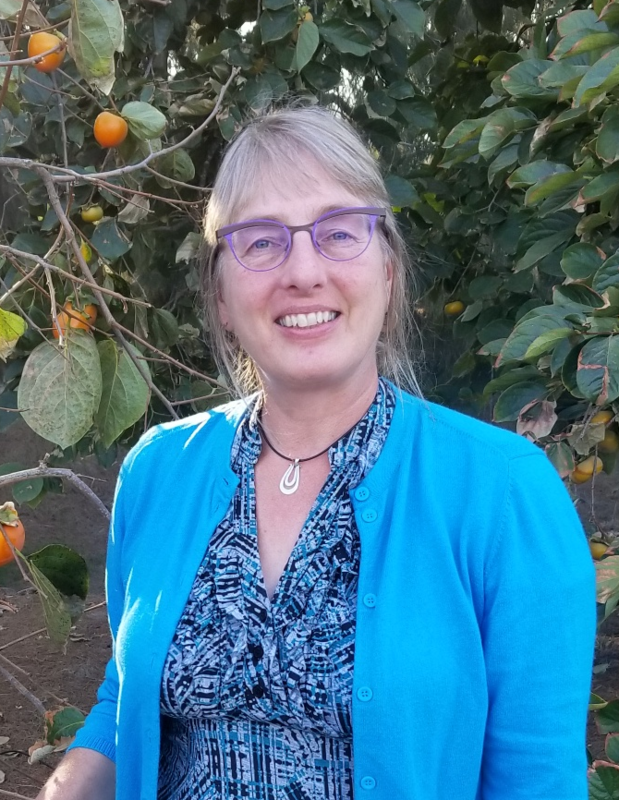 “Glenda embodies what CA Forward and the California Stewardship Network are all about: empowering regional hubs to own their own future,” added Gore, who served with Humiston at the U.S. Department of Agriculture as presidential appointees under President Obama. 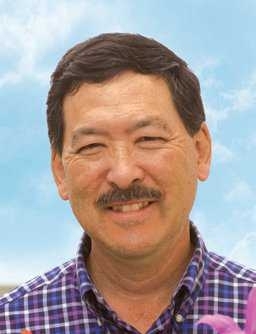 Steve Koike, emeritus UCCE advisor in Monterey and Santa Cruz counties and current lab director of TriCal Diagnostics, has been awarded the 2018 Outstanding Contribution to Agriculture Award from the California Association of Pest Control Advisers (CAPCA). CAPCA gives the prestigious award to people who have made a meaningful difference in support of California agriculture. Over the course of the past 11 months, UC ANR has undertaken a position call process to identify the priority UCCE advisor and UCCE specialist position needs to support the work of the division. After a great deal of work, 46 positions were identified by the UC ANR Program Council and divided into three categories (highest, high, and can wait). Although we will utilize this categorization to the degree possible, the reality is that we need each and every one of those positions to serve our mission – all 46 positions are high priority to me. Furthermore, there are additional positions needed that were not on the list of 46 positions but are important gaps that have arisen over the course of the year. This includes three CE advisor positions vacated within two years of hire and not re-opened for recruitment. Despite that, and unlike past years, we will not be releasing a list of approved positions at this time. The current budget situation leaves us unable to recruit immediately for positions reviewed during the 2018 process. All positions will remain under consideration based on funding availability, including the opportunity to find funding partners to share position costs. This difficult decision is part of a larger effort to manage a challenging financial situation that also includes reductions to statewide programs and less subsidy for research at our RECs. 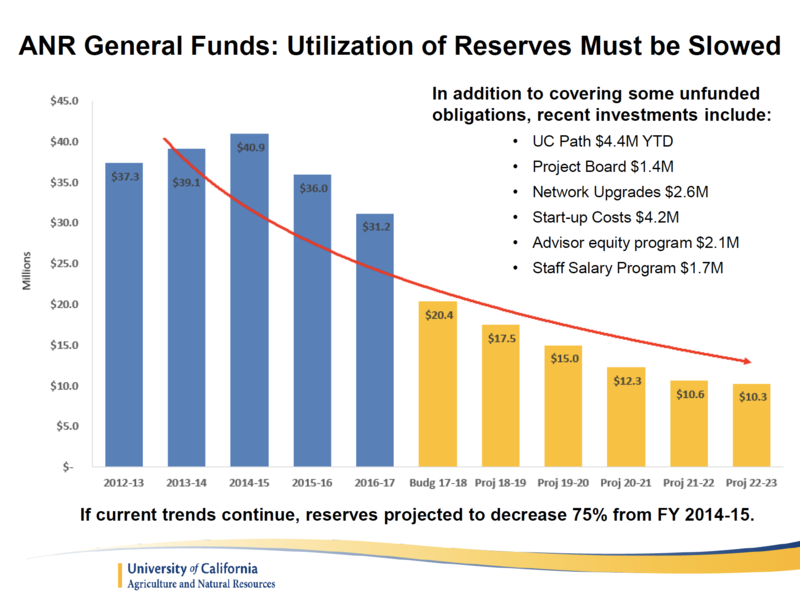 UC ANR has managed the past several years of budget cuts and unfunded obligations through judicious use of our reserves, increases to program fees, fundraising and excellent work by our academics to increase the capture of competitive grants. While those options allow us to maintain a strong program and continue to deliver our research and extension mission, sound fiscal management does not allow us to expand academic positions in the immediate future. Having said that, it is my sincere intent to recruit for a small number of these 2018 positions during the 2019 calendar year. As the FY19/20 budget unfolds, we will closely watch retirement announcements, the impact of those retirements on critical gaps in service, and any other items that might affect the budget available for recruiting. In addition, we will actively seek opportunities to partner with various entities to jointly fund positions as a key strategy to maintain or, preferably, increase our academic numbers. As a result, the order of recruitments may vary from the categorized list provided to me and we may also need to re-evaluate whether priorities have changed along the way. Our academic numbers remain steady, not growing at a rate we wish to see, but steady nonetheless. This is in large part because academic HR, search committees, vice provosts, and campus departments have worked very hard over the last two years to recruit talent and fill positions identified during the 2014 and 2016 position call processes. All of the positions approved during the 2014 call have been filled; you might recall that at the time that the 2016 positions were approved, 25 of the positions approved in 2014 were still vacant. All but three of the 26 positions approved in the 2016 position call process are filled or under recruitment. The remaining positions (two CE advisor and one CE specialist positions) will be released for recruitment very soon. Additionally, the three FTE that were reserved for partnership opportunities have resulted in six new academics: three CE advisor positions filled, one CE advisor position under recruitment, and two CE specialist positions under recruitment. This valuable tool allows us to jointly fund positions with external partners as well as other parts of the UC system; we will be exploring how best to expand and leverage this moving forward. Recruitment and retention of top talent is a crucial strategic objective. Toward that end, I recently announced approval of year two of a four-year salary equity plan for CE advisors that will bring their salaries into market norms. Offering competitive salaries to our academics and staff is of highest priority to me and the entire UC ANR leadership. Despite our budget challenges, we are pleased to be able to continue with this extremely important plan to improve academic salaries that had failed to keep pace with increased cost of living and academic norms for many years. 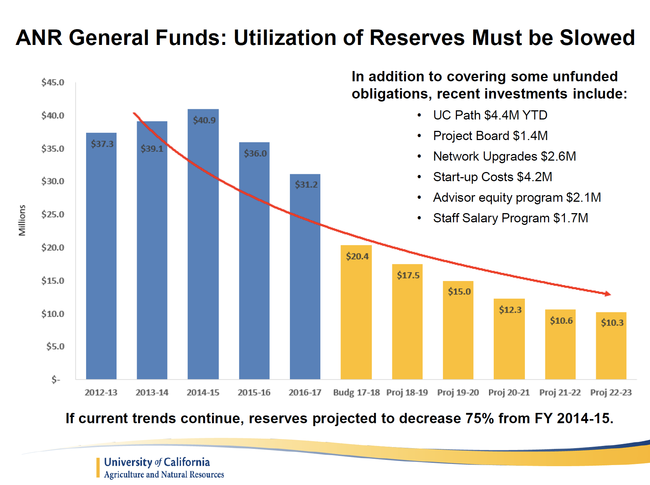 While the current budget situation for UC ANR is reminiscent of similar scenarios in the past, it is a strong wake-up call on the need to find new ways to fund our mission. State and federal support for the land grant mission has decreased or, at best, remained flat for the past few decades. UC ANR, the national Cooperative Extension system, the Agriculture Experiment Station system, and public research institutions in general, are at a crossroads – we must develop better ways to fund our mission, deliver our programs and leverage partnerships. This will include deployment of different business models. UC ANR is actively doing just that, while adapting to change along the way. I am confident that by remaining mission-focused we will grow stronger, more impactful, and more relevant to California and beyond. To answer questions about the positions process, VP Humiston held a town hall on Nov. 29. A recording of the 30-minute town hall is at http://bit.ly/2BGvO73.